Moving places is a difficult and sometimes messy affair. You’ve got a ton of things to keep track of, which can often make moving unnecessarily stressful. But with the right tools, your moving process can go much easier. Skip the Tip recommends hiring skip bins when moving, and in this article, we laid down some insights to help you understand why. 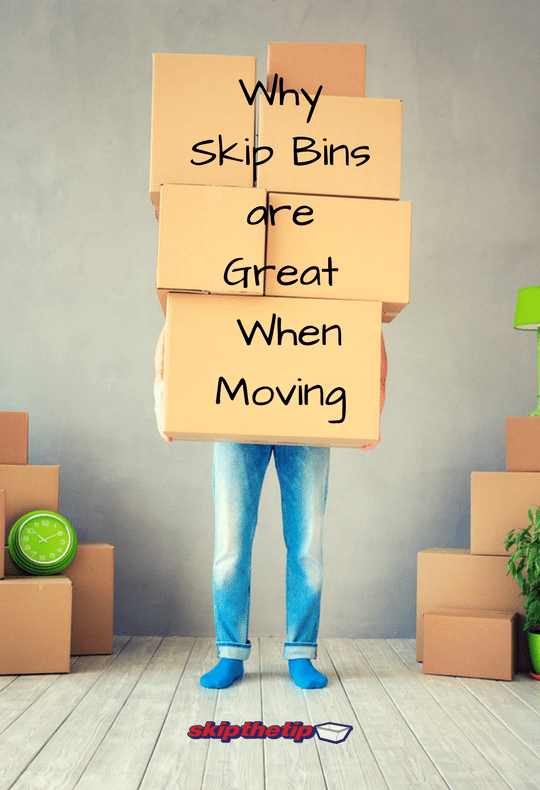 Why should I consider skip bins when moving? Anything you can do to make moving an easier process should be at the top of your list of things to consider. Moving places and leaving your old home behind means ticking off a long checklist of things to do. This includes discontinuing utilities and updating forwarding addresses, making time for packing and loading, and taking care of your inventory. This is where skip bin hire steps in. Taking care of your property boils down to determining which of your things you will keep and take to your new place, and which ones you’ll throw away. When it comes to rubbish removal in Newcastle, skip bins are your best bet. What are the benefits of hiring a skip bin when moving? When people think of the benefits of a skip rental, they think of the weekly waste removal process every house goes through. But it’s also incredibly beneficial when moving houses. The alternative to skip bin hire is trying to stuff everything into an outdoor bin, or even taking your loads of rubbish into the waste management facility yourself. Both of those things are obviously undesirable. You’ll have an easier time moving because you don’t need to think about what will happen to your waste later. A skip bin hire professional team can make waste removal easy. Moving is also a lot easier when your rubbish is tucked neatly away, and you won’t get confused between the things you are moving to your new home and the things you are throwing out. Skip bin hire, versus the alternatives, promises easier pickup, and a hassle-free removal. All you have to do is call the Newcastle skip bin service and they will come to you. Some people make the costly mistake of moving things they don’t need or even want into their new home because they didn’t think of hiring a skip bin to take care of their rubbish. This takes up the time of the movers and space in the moving van or truck, which are expensive. Maximise your moving by putting everything you don’t want into a skip bin. What types of waste could you put into a skip bin? You do have to make considerations for rubbish like bricks, dirt, concrete, sand, and tiles. These can only be accommodated by skip bins to a limited extent due to weight restrictions. When should you hire a skip bin when moving? To get the full benefits of skip rental in Newcastle when it comes to convenience and cost-effectiveness, it’s best to follow a schedule. You should be organising your items at least eight weeks before your moving day. Deciding whether you’ll have space for storage, what you would like to sell, donate, or throw. Keeping to a checklist can help reduce the stress. Four weeks prior to the move is the time to hire a skip bin. You can throw everything you’ve marked rubbish in. You also don’t need to finish filling the skip bin in a day. When you are ready, call for pickup. Who should I contact for skip bins when moving? Trust skip bin rental companies which have experience, professional service, and good quality skip bins. Skip the Tip has a background of 16 years’ experience in the Newcastle, Lake Macquarie, and Hunter Valley. You have the choice of cheap skip bins and premier skip bins, with sizes ranging from 2m3 to 30m3. Your needs come first. Skip the Tip has a reliable and prompt service, with a convenient and easy to use 24/7 online booking system. It’s easy to call for a skip bin delivery and for pick-up. If your moving day is getting closer, then it’s high time you to call for a skip bin. Make your life easier.